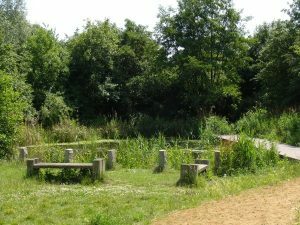 Newton Farm Ecology Park is a small area of wood and grassland lying between Alexandra Avenue and Rayner’s Lane in the south of the borough. Although the meadow areas are attractive at present they are species-poor. Current management is aimed at increasing the species diversity in the grassland areas, restoring the Healing Garden and tackling the historic litter problem! The Healing Garden contains many attractive native wild flowers and cottage garden plants originally selected because in earlier times they were believed to have healing properties. The area has now run wild and is a riot of flowers in summer. Last year [2017-2018] the Newton Farm Park Volunteers restored the wooden palisade fence which is integral to the structure of the Healing Garden. This year we plan to improve the plantings. This will be a focus of work in the year 2019. The dry meadow and wet meadow have now been under a regime to cut grass and collect arisings for three years. This regime is designed to improve biodiversity by allowing less hardy wildflowers to grow. We will continue this and monitor increases in biodiversity in the meadows this year. Newton farm Ecology Park has two watercourses. The Yeading brook runs down the north side of the park and a tributary of the Roxbourne runs across the foot of the park. 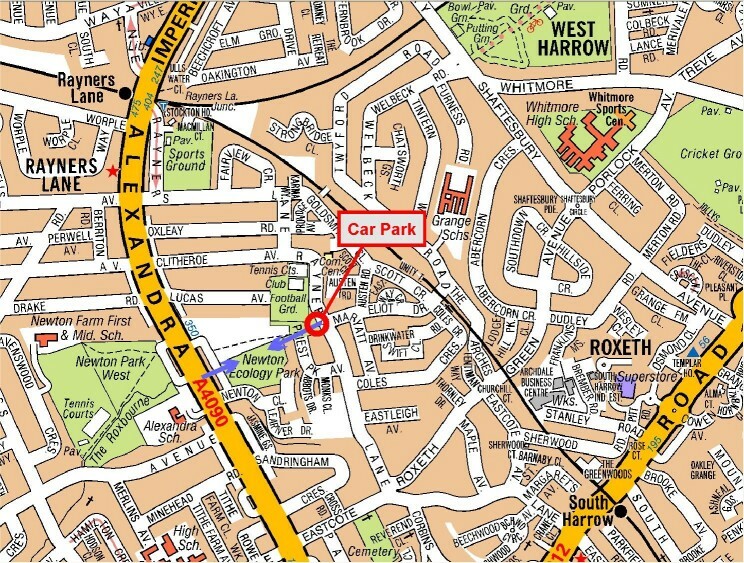 Both meet at the Alexander Avenue end of the park, join and run underneath the road into Newton Park West. These are tributaries of the Crane River. Water quality continues to be a concern, however, we have been in contact with Harrow Council and Thames 21 as well as the Crane River Project. We are actively working to improve watercourses which run through the park and have had some success at improving the quality. The site is naturally wet and so willow trees do well. The line of big trees between the dry and wet meadows are the Great or White Willow Salix alba (see right), while to the north of the dry meadow is a thicket of Osier Salix viminalis. In summer dragonflies and damsel flies hawk around the pond. Damsel flies are the small, delicate ones while dragon flies are large, strong fliers. Map above reproduced by permission of Geographers’ A-Z Map Co. Ltd. (c)Crown Copyright 2009. All rights reserved. Licence number 100017302. Newton Farm Ecology Park is situated south of Rayner’s Lane station between Alexandra Avenue and Rayner’s Lane. The post code is HA2 9DA. The western entrance is a little difficult to find: it is on a service road running parallel with Alexandra Avenue and separated from the main road by a wall. Don’t get confused by a sign for the Newton Park Allotments: the entrance to the Ecology Park is 100 yards south of the entrance to the allotments. The eastern entrance, on Rayner’s Lane, is more obvious and has a small car park. This is the meeting point for all walks and working parties. Bus H12 runs along Rayner’s Lane while bus 398 runs along Alexandra Avenue. Read "A new year begins!" Newton Farm Ecology Park Volunteers's website is hosted by, but not compiled by TCV. 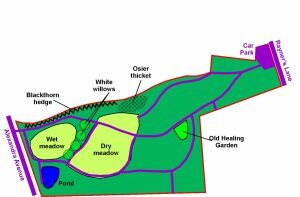 The information contained on this website is for general information purposes only, supplied by Newton Farm Ecology Park Volunteers. The views provided by Newton Farm Ecology Park Volunteers are not representative of TCV. TCV is not liable for any loss or damage including, indirect or significant loss or damage, or any loss or damage whatsoever arising from loss of data or in connection with, the use of Newton Farm Ecology Park Volunteers's website. TCV does not endorse, control or approve the content on Newton Farm Ecology Park Volunteers's website.